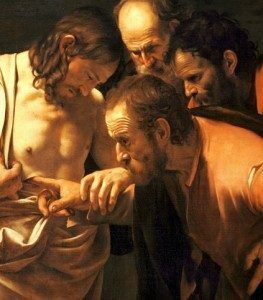 The stunning detail at left from a painting by Caravaggio (1571-1610) shows St. Thomas the Apostle placing his fingers in the spear wound that was inflicted upon Jesus after he died (John 19:34). The evangelist says that when Jesus was stabbed in the side to make sure he was in fact dead, blood and water gushed out. Is it? Is the Gospel of the risen Lord too good to be true in our own day, for us? There is good reason it might be. We live in a world in which little is credible. Recently the Whitehouse reported that a whole fleet of Navy vessels was on its way to the area around North Korea, including the aircraft carrier USS Carl Vinson. The next day the news reported the USS Carl Vinson was sailing in the opposite direction. What to believe, if anything? Fake news. Fake science. Fake people. In this environment skepticism seems to be the order of the day, and so we can identify with Thomas. Grace and peace to you from God the Father and our risen Lord Jesus Christ in the fellowship of the Holy Spirit! I pray that God has blessed you with a joyful celebration of the resurrection of our Lord. What joy it is to know that because He is risen we live forever in His presence. I am writing you today to let you know that, after prayerful deliberation and consultation with brother pastors, our District President, and others, I have been led by the Holy Spirit to accept a new call to serve Trinity Lutheran Church in Sheridan, Oregon as its Intentional Interim Pastor. Last Wednesday, at its regular meeting of April 12, 2017, your Church Council was gracious in granting me a peaceful release from my duties at Shepherd of the Valley effective May 14, 2017. My last Sunday with you will be May 7, 2017. I am most grateful that God has provided me the opportunity to serve you as your Intentional Interim Pastor these past twenty-two months. Even more, I am grateful for the kindness, prayers, and support I have received during this interim, and want you to know that I will miss you all. As was shared by the Call Committee several months ago when they addressed the congregation, the training I have as a credentialed intentional interim pastor means that we, who serve in this capacity, are almost always in some stage of saying “hello,” and then bidding farewell to those we have come to know and love as brothers and sisters on the journey of the Christian life together. May God be gracious to us and bless us as we bid farewell and Godspeed to one another over the next several weeks.